Learning: Take a Step Back in Time to the Old Country. "If you want a great combination of vintage items, creative fun, and a learning experience, you should take your family here!" 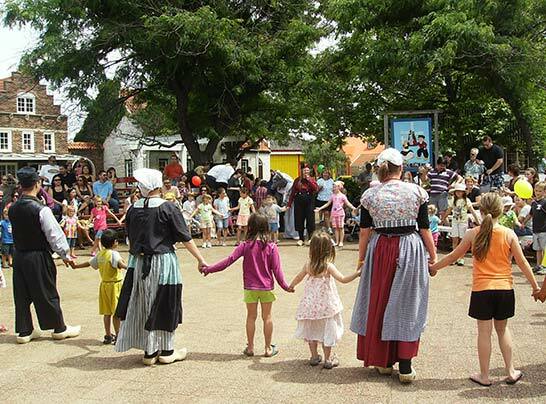 A day at Dutch Village means a day learning about the culture and history of the Netherlands. Your family will love the bits of daily life presented around our park. Originally a wayside chapel for vacationers & maintained by Hardewyk Church, it was donated to Nelis' Dutch Village in the 1970s. The Dutch wedding wagon was used by the wedding party to ride to the church and city hall. This spectacular Amsterdam street organ has been entertaining crowds since 1880. Learn how street organs were played without electricity. Demonstrations: At times listed in visitors' daily guide. Watch our dancers, dressed in costumes of the Netherlands, perform folk dances to the tunes of our Golden Angel Street Organ. Visitors are invited to learn some easy folk dances. It's fun. Performances: At times listed in visitors' daily guide. See farm house cheese made using old world equipment. From cow's milk to finished cheese wheel, you can see it all. Demonstration times are listed in visitors' daily guide. Visit a house filled with amenities of a typical home, with beds built into cupboards, wooden shoes lined up at the door, and food in the pantry. The barn is attached to the house and is filled with our petting farm animals. In the olden days, the heat of the animals in the barn helped keep the house warm. The barn also protected the animals from thieves. 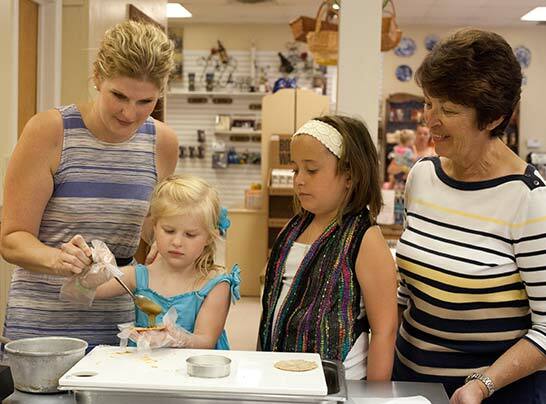 Stop in and experience some old Dutch traditions. Everyday and special event costumes are displayed along with equipment used to farm tulips. Read the history of the founding Nelis family's tulip farm. Presentations: At times listed in visitors' daily guide. A 17th century weighhouse which measured commodities and was used to prove guilt or innocence of witchcraft during a brief period of history. The history of the ceramics dates back over 400 years.. You can learn about the 11 step process for turning clay into the beautiful hand-made Dutch delftware pottery. We'll also show you the significance of the factory marks on the pieces and how to identify a high quality antique from a cheap knock-off souvenir. Making the chips fly while using antique hand tools and antique automated machines, our wooden shoe carver will shape a block of wood into a shoe. 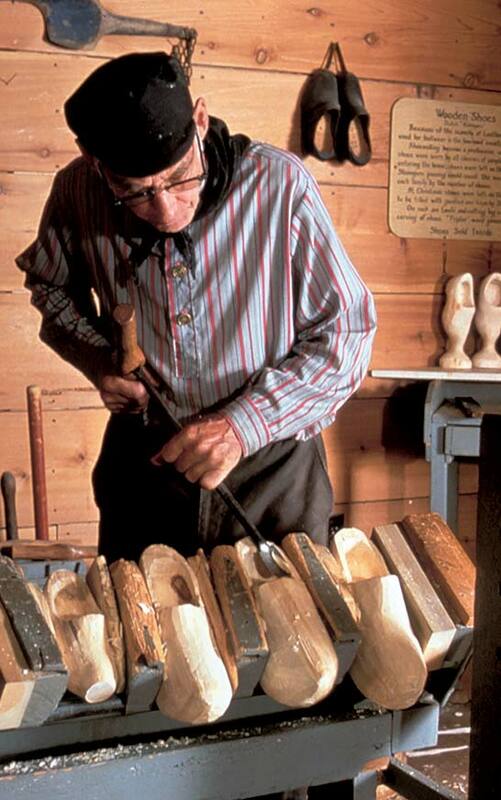 You will also learn about wooden shoes in the history of Holland. Several demonstrations daily in season. Times are listed in visitors' daily guide. In our Old Dutch Schoolhouse, senior visitors can revisit the days of the one-room schoolhouse and reminisce about a time gone by. You'll also have a chance to learn a few Dutch words, taught by our own Dutch Dancers. The Nelis Tulip Farm exhibit features antique tulip bulb machinery and provides a history stretching back over 90 years for this family business. 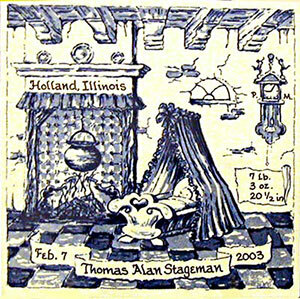 This adorable keepsake 6" birth tile is customized at Dutch Village, lacquered to seal the tile and delivered to you. Remember your family's next birth with this Dutch Village tradition. What is included with admission to Dutch Village? All presentations, demonstrations, petting farm and rides are included with your admission. The only additional fees you'll pay are for merchandise and food. Is Dutch Village just for kids? No, we have activities and presentations for all ages. 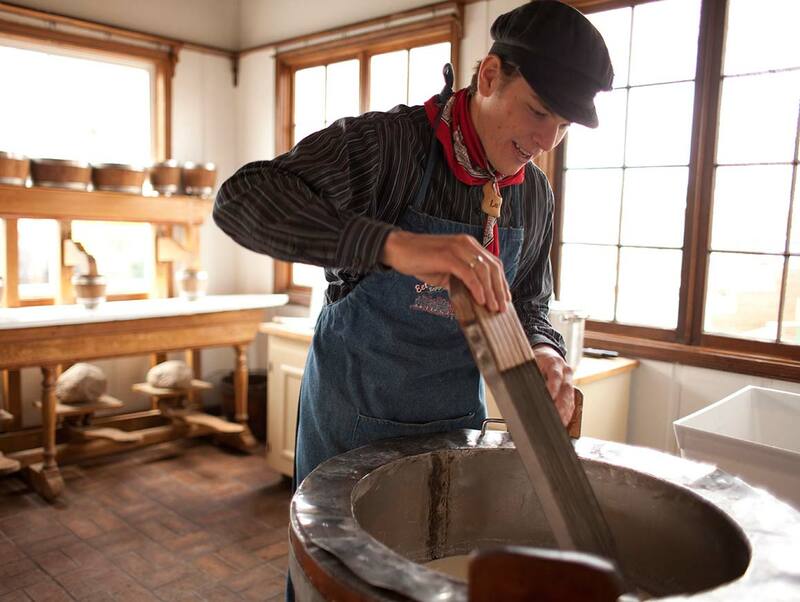 Everyone that visits the village will enjoy learning about what life was like in the Netherlands over 150 years ago. Do I have to pay for admission if I just want to shop? No, our "seaside" shop, pub and cafe are located ouside of the village area. There are additional shops with additional merchandise located inside the park requiring paid admission. Once a guest has paid admission their hand is stamped so they may enter and exit the village as often as they would like that day.